One of the essential principles of the Symfony project is that documentation is as important as code. That's why a great amount of resources are dedicated to documenting new features and to keeping the rest of the documentation up-to-date. More than 1,000 developers all around the world have contributed to Symfony's documentation and we are glad that you are considering joining this big family. This guide will explain everything you need to contribute to the Symfony documentation. Symfony documentation is written using reStructuredText markup language. If you are not familiar with this format, read this article for a quick overview of its basic features. 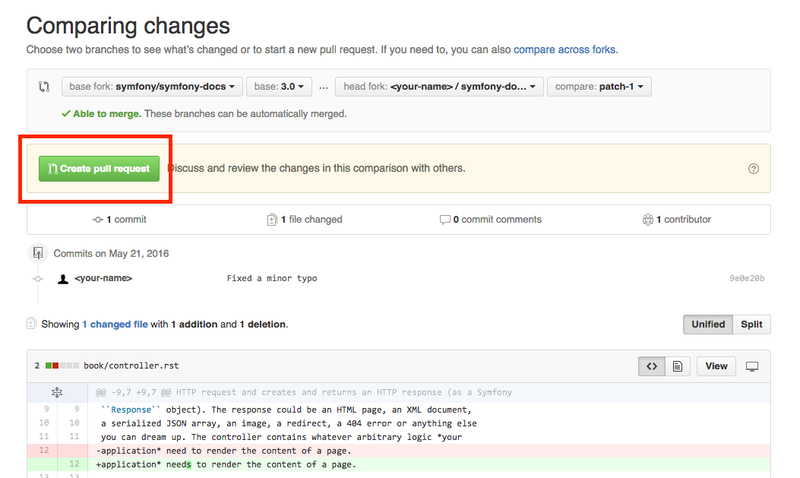 Symfony documentation is hosted on GitHub. You'll need a free GitHub user account to contribute to the documentation. Symfony documentation is published under a Creative Commons BY-SA 3.0 License and all your contributions will implicitly adhere to that license. In this example, the name of the branch is improve_install_chapter and the upstream/2.7 value tells Git to create this branch based on the 2.7 branch of the upstream remote, which is the original Symfony Docs repository. Fixes should always be based on the oldest maintained branch which contains the error. Nowadays this is the 2.7 branch. If you are instead documenting a new feature, switch to the first Symfony version that included it, e.g. upstream/3.1. Not sure? That's ok! Just use the upstream/master branch. The origin value is the name of the Git remote that corresponds to your forked repository and improve_install_chapter is the name of the branch you created previously. Step 7. Everything is now ready to initiate a pull request. Go to your forked repository at https//github.com/<YOUR GITHUB USERNAME>/symfony-docs and click on the Pull Requests link located in the sidebar. In this example, the base fork should be symfony/symfony-docs and the base branch should be the 2.7, which is the branch that you selected to base your changes on. The head fork should be your forked copy of symfony-docs and the compare branch should be improve_install_chapter, which is the name of the branch you created and where you made your changes. Step 10. After your pull request is eventually accepted and merged in the Symfony documentation, you will be included in the Symfony Documentation Contributors list. Moreover, if you happen to have a SensioLabsConnect profile, you will get a cool Symfony Documentation Badge. Every GitHub Pull Request is automatically built and deployed by Platform.sh on a single environment that you can access on your browser to review your changes. To access the Platform.sh environment URL, go to your Pull Request page on GitHub, click on the Show all checks link and finally, click on the Details link displayed for Platform.sh service. Only Pull Requests to maintained branches are automatically built by Platform.sh. Check the roadmap for maintained branches. Unless you're documenting a feature that was introduced after Symfony 2.7, your changes should always be based on the 2.7 branch. Documentation managers will use the necessary Git-magic to also apply your changes to all the active branches of the documentation.